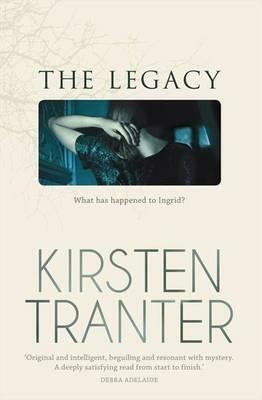 Kirsten Tranter’s first novel, The Legacy, a genre-mixing post-9/11 mystery, is among the most eagerly anticipated debuts of 2009. The structure, characters and situations in The Legacy borrow heavily from Henry James’s Portrait of a Lady. What made you decide to write a contemporary twist on that novel? I’ve always been drawn to literature that responds to other works of art, other literature; that reshapes stories or tells them from different perspectives. I have been fascinated by Portrait ever since I read it as an undergraduate at Sydney Uni. It was presented to me by my eccentric and brilliant tutor at the time as a cruel revision of George Eliot’s Middlemarch, a perspective that I’ve never been able to really shake off. I think it was seeing the book in these terms that drew me to thinking about making my own version of the story, seeing it as a version of a manipulable narrative idea. A long time passed before I found what seemed like the right way to go about it. In the meantime, I became completely immersed in the literature of the Renaissance, while I was working on my PhD at Rutgers, and of course in the Renaissance, literature is all about revisiting and recycling the classics and other stories. Shakespeare does it, Spenser does it; everyone does it. It’s a habit of mind pretty alien to how we mostly now think about originality and creativity that I became somehow comfortable with to the point where re-writing Portrait of a Lady didn’t seem quite as crazy or hubristic as it had done before. It is such a compelling, and yet a horrendous story. I hate what happens to Isabel, even though she’s not my favourite character in all literature. Like many readers, I wanted it to end differently – but I wanted to find a way of revising it that wouldn’t be simplistic, that wouldn’t simply give the Isabel character an easy way out or cheesy happy ending. Instead, I wanted to find a way of retelling the story that investigated that very feeling, that very desire (ambivalent and complicated as it is) to rescue her, to make a different ending for her. The Legacy is rich in intertextual references and nods to various literary genres. There are echoes of Brideshead Revisited (the university student infatuated with the glamourous family of a classmate); The Secret History (intrigue within an East Coast university Classics department) and various nods to detective noir and nineteenth-century romance. How much of this was conscious? And what were your literary influences when writing this, apart from Henry James? Donna Tartt and Evelyn Waugh were major influences, yes – Donna Tartt especially for the way she writes a mystery that kind of transcends the genre and manages to be both literary and really accessible; and I was also reading a lot of Edith Wharton and Raymond Chandler. Chandler’s The Big Sleep is the other major intertext apart from Portrait – I just love its dizzying, surreal twists, and the very minor character of the clever bookshop assistant was the inspiration for my narrator Julia. A lot of it was conscious and came from, as I mentioned above, an immersion in Renaissance literature and its habits of compulsive allusion. I love the way literature is made from bits and pieces of other literature, always in conversation with what has gone before, and I’m happy to play with that in a fairly self-conscious way – but it was important to me that the story always remain accessible, that the reader doesn’t need to have read Henry James or Raymond Chandler in order to enjoy or understand my novel. It’s not just books that are made from other books; especially for people like me who are obsessive readers and movie watchers, stories, especially the frameworks of romance, actually frame experience to a huge extent, and that was something I was trying to get across in the book as well. Ralph and Julia first become friends by quoting Chandler to one another, by acting out parts from a movie they both love, and in some ways they live like that too, imagining themselves as the stars (or in Julia’s case as a marginal character) in the stories of their own lives. Life imitates art, as the man said. That’s something I remember about the intensity of life and love as a very young adult, learning how to make sense of bewildering emotional experiences through the frameworks of literature and film. The Legacy is, among other things, a post-9/11 mystery novel, with the central character’s disappearance at the World Trade Centre on the day the towers collapsed at the core of the novel. It explores ‘the secret cherished hope of everyone who lost someone on that day, after all – that she was not dead, but missing’. What drew you to this as a theme? It was hard to go through 9/11 as a resident of New York, as I was at the time, and not to be profoundly affected by that very desire and hope, which was everywhere, written up in all the hundreds of ‘missing’ posters that stayed up for months afterwards. In the aftermath I started thinking about building a story around that idea – that kind of hopeless hope. It came together with my thoughts about Portrait in a way that just seemed right. The ending of Portrait is ambiguous enough that I go back to it every now and again, looking for some kind of clue or possibility that it just doesn’t have to be that way … but it always is the same old horrible thing! I suppose that desire seemed to me to have some affinities with that desire on the part of people after 9/11 – a desire for a different ending. What was interesting to me was not so much the actual fate that Ingrid meets, but rather to explore the desire for her to have escaped that particular fate, the meaning of that desire. A strong sense of inevitability underlies the novel. These characters – Ingrid, Ralph, Julia – engineer their own fates, often driven by pride and perversity. How important was this sense of inevitability to you when writing the novel? It was very important. Julia has to make a decisive break at the end of the story, to stop being so passive in the face of her fate, and instead take her destiny into her own hands, even though it means giving up a friendship with someone she loves very much. Pride and perversity are definitely the things that make for Ingrid’s downfall, her tragedy. The story plays with ideas about whether our fate is fixed; whether we can know the future, or know ourselves – whether our handwriting reveals the truth about our characters, or whether tea leaves can predict the course of our lives. The interplay between what is determined for us – by the unconscious, by social forces, by fate, by character, by the machinations of others, by whatever external forces – and what we determine for ourselves, as knowing, intelligent, imaginative individuals, is endlessly interesting to me. Your central characters all seem to be in love with the idea of love, but unsuccessful at its practice. They’re all attracted to the unattainable in different ways. Why do you think that is? And does this reflect a wider truth about the nature of attraction, or is it particular to your characters? The darker side of love – unrequited love, perverse and impossible desire, the interplay of power and subjection – has a lot going for it in terms of dramatic material. There’s always an element of mystery in attraction, a sense of unconscious emotional forces at work that we can’t understand, which makes it always fascinating. I think the mix of pride and perversity that you mention above has something to do with it, in terms of why love plays out so disastrously for these particular characters. But I’m not trying to say that this is a wider truth; in fact at the end, the story tries to open onto a more optimistic possibility of authentic emotional connection, for one major character at least. There is an ongoing divide between worlds in The Legacy: between the ‘frantic light night urban world’ of Julia, Ralph and Ingrid’s university nights and the ‘high-class opulence of Ralph’s house’ that they inhabit during the day. There’s also the contrast between Julia’s student digs in Newtown, and Ingrid and Ralph’s Kirribilli residence; between Sydney and New York; between Ingrid’s life with her friends and her life with husband Gilbert Grey. What attracts you, as a writer, to characters who move between different worlds? In a literary sense, these characters are attractive because of their element of distance or detachment – whatever it takes to retain a foothold in each of the different worlds they move between. The noir detective is an appealing embodiment of that idea, the figure who can enter any world and yet doesn’t belong to any – he’s set apart, it’s his very apartness and difference that enables him to move so easily, not being bound to any one place. But loneliness, isolation, is a consequence of that ability as well. It’s always more interesting to imagine a world from the perspective of an outsider; it might seem more ideal, as Brideshead does at first to Charles Ryder, or the Classics group of friends does to Richard Papen in The Secret History, or England and Europe to Isabel Archer, but they are also capable of confronting its limitations, and they are forced to. The outsider who is seduced, corrupted or exploited, betrayed – it’s an interesting story. On a personal level, I’ve spent a lot of the last ten years moving between the different worlds of Sydney and New York City (with stopovers in the still other worlds of Darwin and upstate New York), so I think I’m probably compelled to explore the peculiar conflicts that come with that experience. In New York, at the World Trade Centre site, ‘the hole in the sky radiated so intensely that is had become presence’. It’s a nice metaphor for the overwhelming presence of Ingrid’s absence. Were there any challenges in writing a book that was driven by the absence of its central character? I never thought of that particular sentence being about Ingrid, but now I always will! It’s true that Ingrid’s absence, her death, drives the story, but she didn’t feel exactly absent while I was writing, because she’s very much there in the first half of the book that recounts the development and disintegration of Julia and Ralph’s friendship with her. But to a certain extent she remains less than fully present – it’s part of her enigma and her mystery, her unknowability (to Julia, at least). There’s a challenge in writing about a character who presents those qualities so strongly, because I still want to create sympathy for her – she can’t seem completely unknowable or all surface, she has to give off the idea that she has depths, even if they are not easily accessible. But the book also presents a challenge in terms of deciding who the central character really is: it’s narrated by Julia, who feels herself to have been always sidelined by beautiful, brilliant Ingrid, and ultimately it is Julia’s story – she has to decide to put herself at the centre, to make it her own.